5.1 note 1 - wtf is yuv? "ffmpeg" - render video files with ffmpeg - several codec profiles are provided and you can choose the video bitrate. "Flash video FLV / Sorenson Spark / Sorenson H.263"
"H.263+ / H.263 version 2"
"Libtheora" - Free lossy video compression format. See also Theora at wikipedia. "H.264 / AVC / MPEG4-AVC"
"H.264 / AVC / MPEG4-AVC (lossless)" - The resulting file is compatible with Sony Vegas and other software based on QuickTime AVC decoders. "MJPEG (Motion Jpeg)" - Each video frame or interlaced field of a digital video sequence is compressed separately as a JPEG image. See also Motion JPEG at wikipedia. "null" - Dummy file for rendering engine testing? "null-tile" - Dummy file for rendering engine testing? 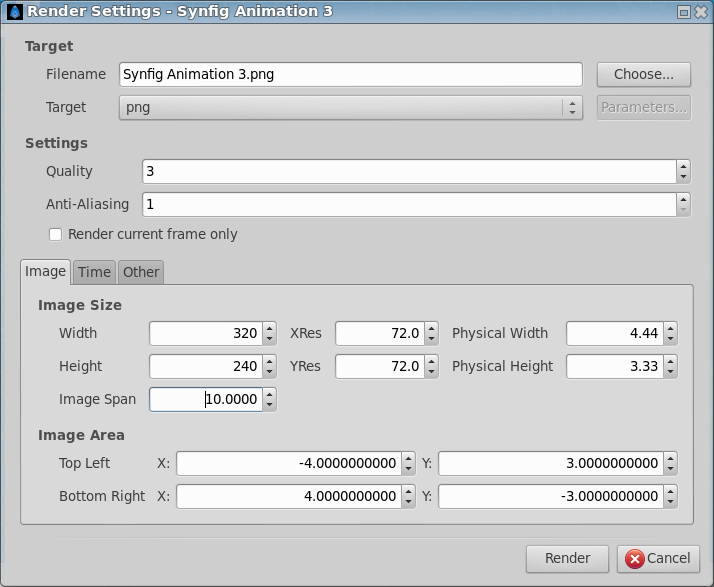 "png-spritesheet" - portable Network graphics - collection of poses in a unique image, can be arranged horizontally or vertically. N/A - libav support not compiled into the Windows version. Rendering to video directly from Synfig under Windows Operating Systems presents some challenges. If you want to render to anything other than .mpg with "ffmpeg", you'll want to save a series of images that represent your animation, to a still format that ffmpeg can read. I recommend "png". Whilst you can render to any size image, if you're going to show your video on Youtube*.mpg->, you may want to take that into account when you render. creates a Flash video file of with the same framerate as used on Youtube. You should be able to submit it to Youtube without the need for the Youtube servers to have to re-compress it. note 1 - wtf is yuv? The yuv file is rendered but it seems to have a not compatible format. See the console output when try to convert to a avi using ffmepg. If you need to render stills (pngs) for something where the final format does not have square pixels, such as PAL or NTSC DV, you can use the approach outlined below. That should produce stills with the right "pixel aspect". When viewed on the PC using square pixels, a circle will appear as an oval. When viewed on a TV with the right pixelaspect, the circle will become a circle. This page was last modified on 4 October 2015, at 10:09.